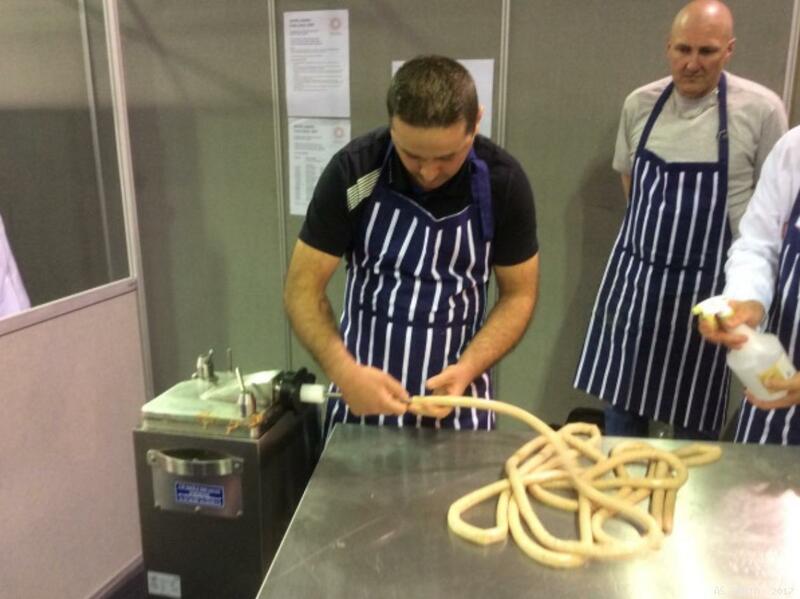 One of the main attractions at this year`s Trade Fair was the Devro Handlink Challenge, for Devro to organise such an event required a lot of planning and assistance, all the meat beforehand was prepped in the PATL individually vacuum bagged into 3.2kg batches, machines and seasoning were supplied by Dalziel Bellshill. 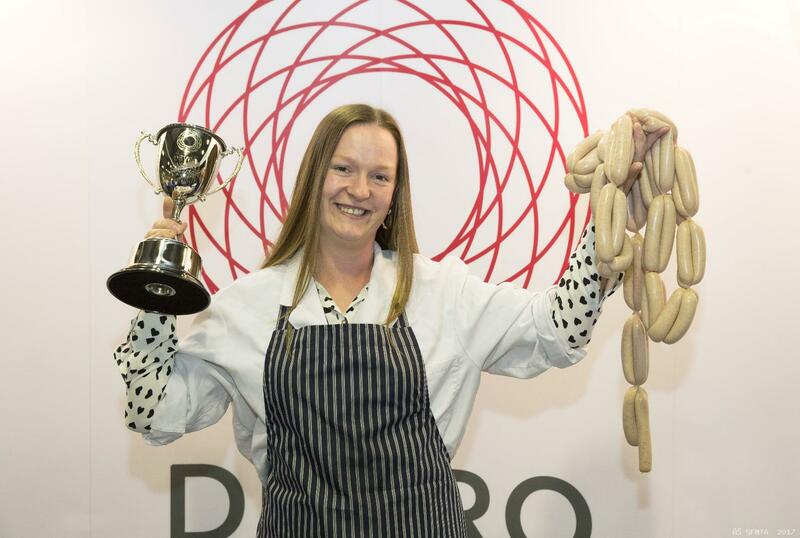 Patrick Clearly, Colin Jenkins (Key account managers), Tim Brown (Chorley Butcher) and myself were on hand setting up the Devro stand on Saturday 13th May making sure that we were ready for Sunday`s show. 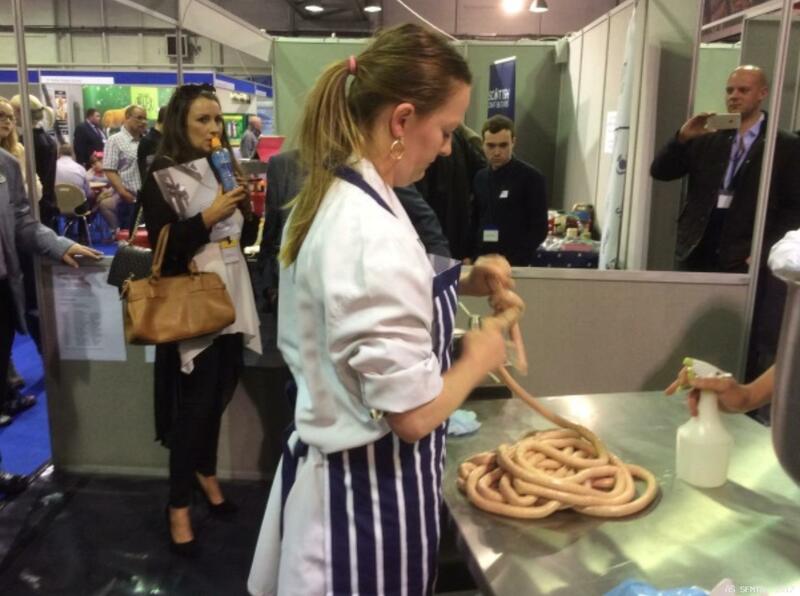 18 entrants had booked there place to take on the Challenge (3 contestants failed to show), each entrant would be given 20 minutes of prep time once they were happy with their setting they then had 1 minute to fill and link as many sausage as possible each sausage had to be 4 inches or over burst links would also not be counted. Mary Fisher (independent adjudicator from FDQ) and Colin Jenkins where the official time keepers having final say on the links counted. Tim Brown of Chorley a previous Guinness World Record holder (60 links) kick started the event with an impressive demonstrating filling 54 links. At one point we were looking at a three way tie and a possible link off between Paul Soutar, Steven McMillan & John Day (45 links each). Anxiously they waited for the last two contestants. Jenna Smith of D.R MacDonald & Son (Lochee Dundee) had one small request (that machine faces the opposite way) as this is how her machine is setup at the shop, this meant her back was towards the crowd. Unfazed off she went and there was no stopping her, 70 links in 1 minute the crowd went wild, not only had she beaten those on 45 links she also smashed Tim`s record, with one contestant left it looked like a done deal. Rafal Wichrowski of D.G Lindsay Butchers (Perth), Rafal made a few adjustments (increased the speed of fill) certainly the quickest at filling out the casing and the hand-linking was just as quick 72 links in 1 minute, this went to a recount Mary and Colin had deducted 3 links for being under the required length, leaving him with 69 links. Jenna Smith the official winner of the Devro Handlink Challenge.